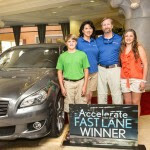 Wyndham Vacation Ownership (WVO), the world’s largest vacation ownership company and a member of the Wyndham Worldwide family of companies, awarded a brand new luxury car to the Todd family during the second drawing in the Company’s Accelerate into the Fast Lane Sweepstakes. In an event at Wyndham Bonnet Creek Resort, company executives presented Chris and Melissa Todd, joined by two of their three children, of Humboldt, TN, with a 2013 Infiniti M.
“I did not believe in a million years that we would win a sweepstakes like this. It has been such a wonderful experience that just keeps getting better, and has truly been a blessing,” said Melissa Todd. “You never hear of anyone who has won something like this, you see a name on a list and that’s about all. To come to Orlando and see the car has been overwhelming. This experience has really been unbelievable,” added Chris Todd. Chris and Melissa have been CLUB WYNDHAM® owners since 2001 and travel frequently with their ownership. In April 2013, during a stay at Wyndham Vacation Resorts Great Smokies Lodge, the Todds were entered into the sweepstakes for a chance to win the luxury car. Their name was randomly drawn from more than 74,000 entries. “The Todds are an example of a family that uses their vacation ownership to its full potential — spending time together and making memories at some of their favorite resorts across the country,” said Jeff Myers, Wyndham Vacation Ownership’s chief sales and marketing officer. Wyndham Vacation Ownership is the world’s largest vacation ownership business, as measured by the number of vacation ownership resorts, individual vacation ownership units and owners of vacation ownership interests.